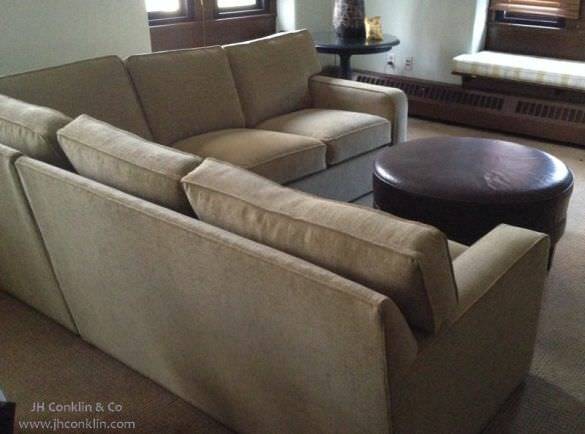 We've had a few calls recently from folks trying to get an idea of the price to recover their sectional sofas. Our Upholstery Price Guide gives a typical range of cost from $2800 to $3200. But they didn't know where their sofa might fall in that range - or if their sectional was even 'typical'. I guess the guide wasn't guide-ful enough for their purposes. So, here are some examples from our prior projects that may help illustrate the price range ... and beyond! They picked a textured chenille solid by Greenhouse. It was 100% polyester with an acrylic backing for stability. At 150,000 double rubs it was definitely 'performance' (read about fabric durability). The synthetic fiber of the fabric was less stain prone than a natural fiber, but they opted for the additional stain resistance of Nanotex protective treatment. 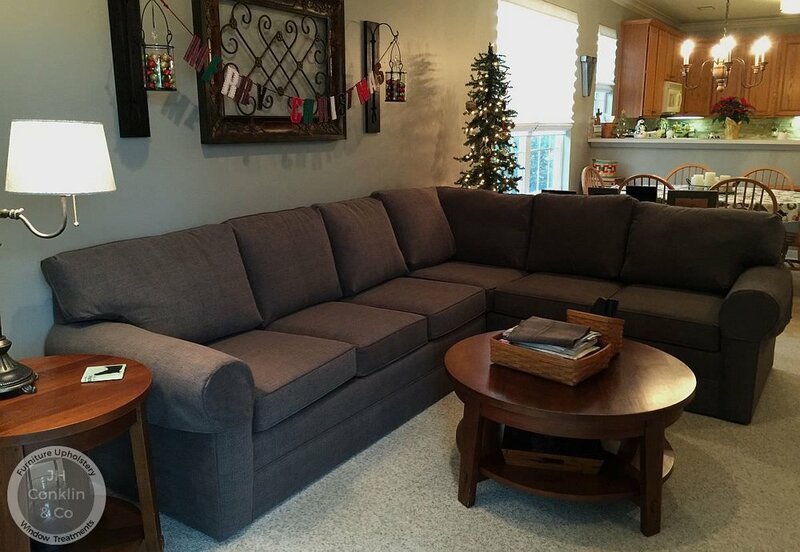 This is a larger sectional from a Delaware home - with some twists. It has five sections. Corner, two ends, a single seat extension and a double seat extension. The twist comes in where the two end units are recliners and the two-seat section is a sleeper. The labor price to upholster this larger, more involved, sectional was $3,150 - also holding within the range listed in our cost guide. The largest residential sectional we've ever worked on came from Ventnor, New Jersey. It had eleven back cushions and nine seat cushions. Nine sections total spanning the entirety of a large family room. I seem to recall them saying that 15 people could sit in it - easily. Two fabrics came into play - one for the back and deck, another for the cushions. The back fabric was a reconstituted leather by Charlotte. Thirty-two yards just made it. The cushion and inside body fabric was by Barrow - which we also had treated with Nanotex and Durablock for maximum spill protection. Ready? Sixty yards. Two yards were left on the roll at the end. Whew. I hope this sheds some light on the factors that play upon the upholstery costs for sectional sofas. These examples exclude the costs of the fabrics - which vary by selection. As ever, the best way to get specific about any project is to reach out to us.